Gelebor is a Knight-Paladin of Auriel and one of the last remaining Snow Elves. He can be found in Darkfall Cave guarding the wayshrine. He is the brother of Arch-Curate Vyrthur and will offer you Auriel's Bow in exchange for your assistance in killing Vyrthur. 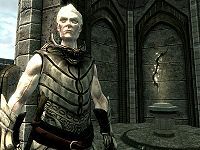 He wears an Ancient Falmer Cuirass, Ancient Falmer Boots and Ancient Falmer Gauntlets, and wields the unique unobtainable Prelate's Mace. Serana: "What's that basin in the center signify?" 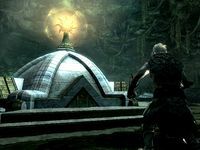 Gelebor: "Once the Initiate completed his mantras, he'd dip a ceremonial ewer in the basin at the wayshrine's center and proceed to the next wayshrine." Serana: "So these Initiates had to lug around a heavy pitcher of water. Marvelous. How long would they have to do that?" Gelebor: "Well, once the Initiate's enlightenment was complete, he'd bring the ewer to the Chantry's Inner Sanctum. Pouring the contents of the ewer into the sacred basin of the Sanctum would allow him to enter for an audience with the Arch-Curate himself." Serana: "All that just to end up dumping it out? Makes no sense to me." Gelebor: "It's symbolic. I don't expect you to understand." Serana: "So let's get this straight. We need to do all that nonsense to get into the temple, so we can kill your brother and claim Auriel's Bow?" Gelebor: "I know how it all sounds, but if there was another way I'd have done it long ago. The only way to get to my brother is by following in the Initiates' footsteps and traveling from wayshrine to wayshrine just as they did. The first lay at the end of Darkfall Passage, a cavern that represents the absence of enlightenment." 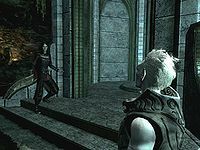 He then turns his attention back to you, saying "There are five in total, spread far apart across the Chantry." When asking how large the caves are, he says "Caves? Oh, no. The Chantry encompasses far more than a few caves, as you'll soon discover. But before I send you on your way, you'll need the Initiate's Ewer." As he gives you the Initiate's Ewer he will give you instructions on what to do: "Once you've located a wayshrine, there will be a spectral Prelate tending to it. They will allow you to draw the waters from the shrine's basin as if you've been enlightened. This may be the last time we're able to converse. If you have any questions before you leave, I suggest you ask them. Otherwise, all I can do now is grant you my hopes for a safe journey." Before leaving via the wayshrine you may ask him some final questions. He'll respond, "Questions? I expected as much." Who are the spectral Prelates? "They're ghosts of the snow elf priests that tended the wayshrines before being slaughtered by the Betrayed. Through the grace of Auri-El they were restored to their spectral form to enable them to continue their duties." Pointing out that this is good and they could help, he will unfortunately inform you that "I'm afraid in their current form, they still believe the Chantry to be an active center of worship. They won't respond to you in any way other than believing that you're an Initiate and you're undertaking the journey to the Inner Sanctum." What is the Chantry of Auri-El? "This is, or was, the epicenter of our religion. Most of the snow elf people worshipped Auri-El. The Chantry was constructed near the beginning of the First Era to provide a retreat for those that wished to become enlightened. Most snow elves? Our empire had temples to some of the other deities: Trinimac, Syrabane, Jephre and Phynaster rounded out the rest. But those temples paled in comparison to the glory of the Chantry and its wayshrines." Asking if the wayshrines of are a part of the chantry he will explain "Oh yes. They were an important part of the process here. They represented the steps the Initiates took on the path to total enlightenment. Sadly, the magic used to construct these wonders were lost long before I arrived here." Who were your people? "We were once a wealthy and prosperous society that occupied a portion of Skyrim. Unfortunately, we were constantly at war with the Nords who claimed the land as their ancestral home. We had always maintained an uneasy alliance with the underground-dwelling dwarves, and when faced with extinction we turned to them for help. Surprisingly, they agreed to protect us but demanded a terrible price... the blinding of our race. There were splinter groups that resisted the agreement, and even some that sought alternate alliances. But when it was all said and done, those elves were either slaughtered, vanished or gave up and took the dwarves' bargain." Asking what turned them into the Betrayed he says "I've often asked myself that very same question. The blinding of my race was supposedly accomplished with a toxin. Certainly not enough to devolve them into the sad and twisted beings they've become. The Chantry is quite isolated, so it took some time for word of the dwarves' offer to reach us here. By the time the compact had been completed, it was too late for us to even attempt to intervene." If you ask if that's why he has retained his sight, he'll answer "Correct. We only numbered perhaps a hundred at a time, so our presence remained a secret to the dwarves and the Nords. Ironically, our undoing came at the hands of our own people." Asking if he is referring to the Betrayed, he will tell you of how they overran the Chantry and took control of the Arch-Curate: "Yes. They swarmed the Chantry in vast numbers until we were completely overrun. We never really stood a chance. I assume that the Arch-Curate was corrupted by them when they found a way to breach the Inner Sanctum." If you inquire about other snow elves he says: "Vyrthur and myself are the only two snow elves that remain." The next time you see Gelebor will be just after you kill Vyrthur; the nearby wayshrine will be restored and Gelebor will emerge from it. "So, the deed has been done. The restoration of this wayshrine means that Vyrthur must be dead and the Betrayed no longer have control over him." He will be shocked to learn that the Betrayed weren't to blame "What? What are you talking about?" He will be surprisingly happy when you tell him that Vyrthur was in fact a vampire "A vampire? I see. That would explain much. Deep inside, it brings me joy that the Betrayed weren't to blame for what happened here. Because that means there's still hope that they might one day shed their hatred and learn to believe in Auri-El once again. It's been a long time since I felt that way and it's been long overdue. My thanks, to both of you. You risked everything to get Auri-El's Bow, and in turn, you've restored the Chantry. I can't think of a more deserving champion to carry it than you. If you wish to learn more about the bow, or obtain Sunhallowed Arrows for it, I'd be more than happy to help. You've but to ask. Please, take the bow... it's yours." After taking the bow, you can ask him what he plans to do from now on, and he will tell you he plans to remain as a Knight-Paladin and protect the Forgotten Vale. "Even with Vyrthur gone and the Inner Sanctum destroyed, my duty as a Knight-Paladin of Auri-El remains. I've been sworn to protect this vale and everything it represents until I die." He also reveals he plans to keep the wayshrines open ("For the time being, they will remain open. If remnants of our kind who escaped the betrayal at the hands of the dwarves exist out there, perhaps they will find this place one day.") and that he wants to see the Chantry back to its former glory but believes those days are long gone. "While it would fill me with joy to see the Chantry back to its former glory, that time has long since passed. Now that my brother's dead, it's quite possible I'm the last of our kind." Telling him that you have contributed to the snow elves' extinction, he will comfort you by saying, "There's no need for that kind of talk. I said it was possible. It's also quite possible that there are some other isolated conclaves of snow elves nestled elsewhere on Nirn. I'll also assume Vyrthur didn't exactly give you the option to stay your hand." Asking what he will do next, he tells you "For the time being I will remain here, on the overlook and continue trying to keep the Sanctum free of the Betrayed. You're always welcome to return here at any time, of course." Asking whether he thinks the Betrayed could ever be cured, he will say "I feel nothing but sympathy for the Betrayed, despite my actions against them. But I'm afraid that they're well beyond a cure at this point. The twisted forms you've seen didn't occur overnight. It isn't a plague or a disease that ravaged our species. The dwarves may have stolen their sight, but it took many generations for them to become what they are today." Asking if there is no hope, he will hint at a possibility of a brighter future: "Perhaps they'll never return to their former appearance, but over the centuries, I've noticed a rise in their intellect. If a line of communication could be established with them, maybe they can find peace. It's the only way they'll discover that they weren't always malignant... they were once a proud and prosperous race." Asking about Auriel's Bow, he will tell you details of the bow and the Sunhallowed elven arrows it can use: "The bow was said to be carried by Auri-El himself into battle against the forces of Lorkhan in ancient and mythic times. Its craftsmanship has no equal anywhere within Tamriel and possibly beyond. The bow draws it power from Aetherius itself, channeling it through the sun. Therefore, when an arrow is loosed from the bow, it produces a magical effect very similar to being burned by fire. That's actually only a fraction of its potential. With Sunhallowed Arrows, you would be able to produce a much more spectacular effect... causing bursts of sunlight to envelop your foes. The sunbursts would certainly hurt anything, but is especially devastating to the undead." Telling him what Vyrthur said about using arrows with blood he will tell you that "Well, using an arrow with the bow that's been dipped in blood may cause it to function differently... corrupting its purpose. That's of course if you're foolish enough to try it." Asking him how to obtain Sunhallowed Arrows he will offer to make them for you: "I can actually assist you in that regard. If you were to bring me some good quality elven arrows, I could imbue them with the proper incantations and rituals." If you ask him, "Can you make me some Sunhallowed Arrows?" he will respond: "Absolutely. I can only do twenty at a time, so if you want the rest of your arrows blessed, let me know." However, if you have no elven arrows he will say "I'm afraid I'll need elven arrows if you want me to produce the Sunhallowed Arrows, and it seems you're all out of them at the moment." Although he can only bless 20 arrows at a time, there is no waiting period before you can ask him to bless the next set, meaning you can bless as many arrows as you have with you. He will remain on the Temple balcony should you wish to bless more. 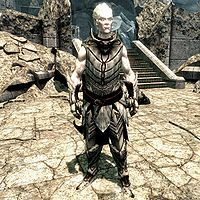 In the game files, he is part of a newly created race known as SnowElfRace. It is largely based off of the High Elf race, and even bears the name "High Elf", but for all intents and purposes Gelebor can be considered to be a Snow Elf. He cannot be attacked; magic and weapons just pass straight through him. He cannot be pickpocketed either; attempting to do so will simply initiate dialogue. The Ancient Falmer Armor that he wears is different from the set you will pick up later in the game; his has no shoulder pads. This page was last modified on 16 January 2016, at 15:37.